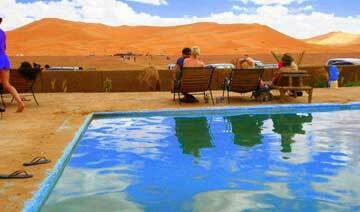 Merzouga is a beautiful small town in the Sahara Desert of Morocco city near the Algerian border. 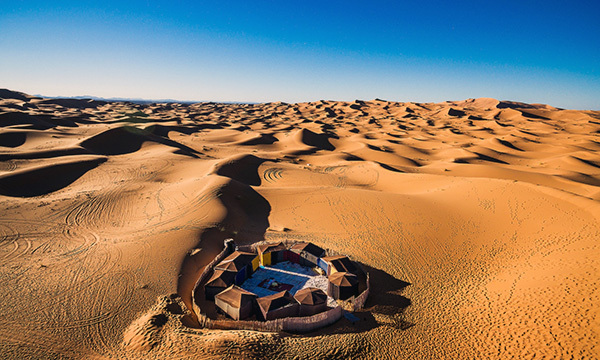 It is situated on the edge of Erg Chebbi, a 50-km long and 5-km wide set of sand dunes reaching up to 350 m. The place’s main attraction is a seasonal salt lake – West of Merzouga, Dayet Srji. In the summer season, it is dry. However, during other seasons the place attracts many travellers with its desert birds, Egyptian nightjars, desert warblers, and colourful flamingos. 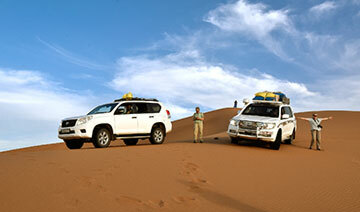 During your 3 days Marrakech to Merzouga desert tours. You head into Morocco’s Sahara Desert on a camel. 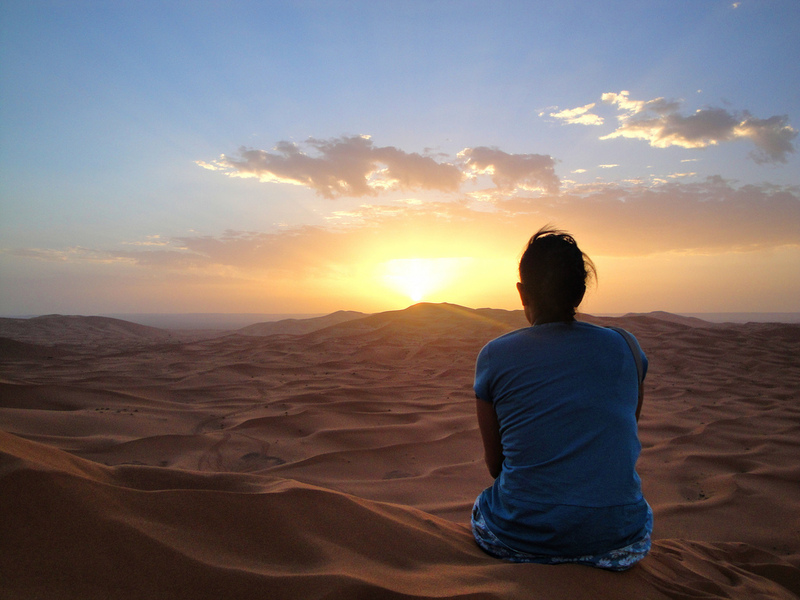 watch the sunset over the Erg Chebbi Dunes. Experience the profound silence and incomparable beauty of the vast night sky, far from the noise or lights of any city. Our guides set up a bedouin-style camp, cook traditional food, and entertain you with the ancient music of Saharan desert dwellers. This overnight tour offers spectacular views and a chance to experience the desert nomad lifestyle and to explore the historical Kasbahs. 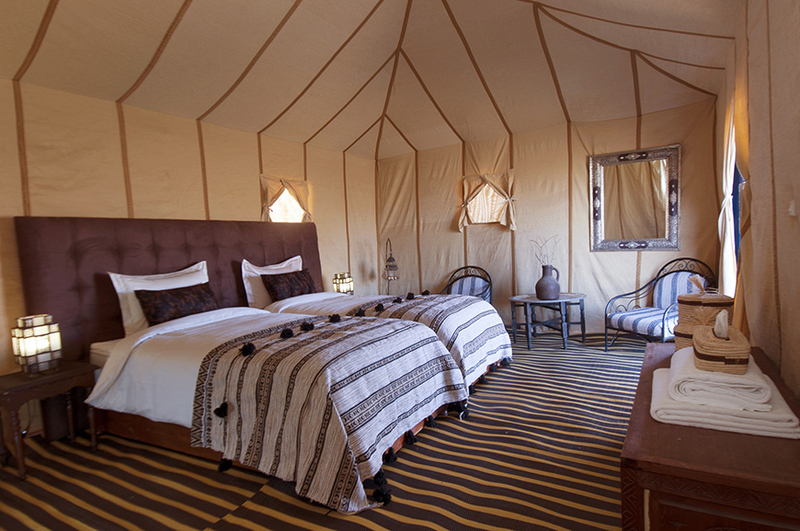 Eat a traditional Moroccan Tagine, take part in a drum circle, and sleep in an authentic Berber tent. 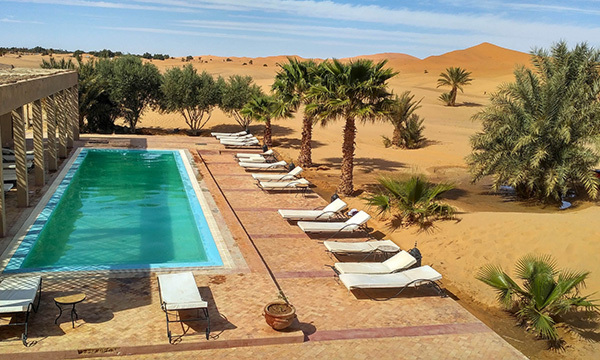 See pink flamingoes at an oasis near Merzouga, and search for desert reptiles and mammals as you trek. We pride ourselves on introducing you to places and experiences far beyond the usual tourist destinations. You will feel the warm hospitality of our cities as well as experiencing their art, history, and culture. You will sample the many delicious varieties of local cuisine. 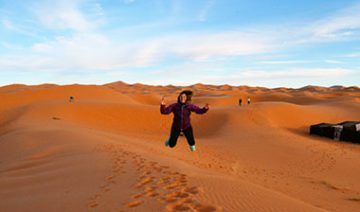 If 3 days Marrakech desert tour to Merzouga itinerary that we offer do not match what you're looking for, contact us and we will prepare the trip to your needs and requirements. 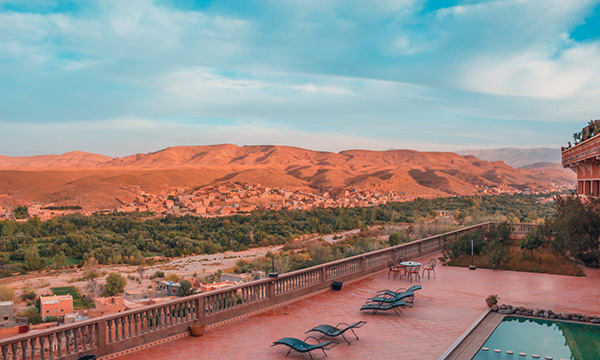 If a long Morocco Camel trekking & overnight in Merzouga camp is not for you can still enjoy the sunset with a shorter Morocco camel Ride and spend the night in the Hotel. 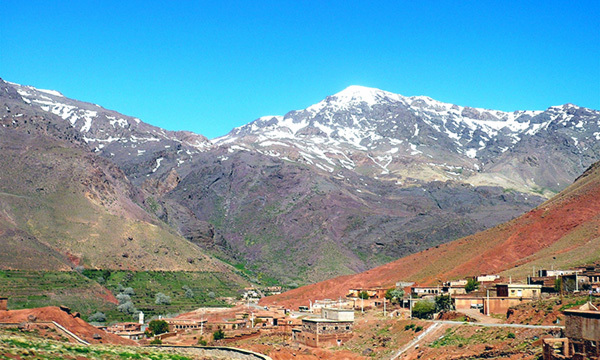 After an early departure, cross the High Atlas Mountains and reach the 2260 m-high Tizi N’Tichka pass. 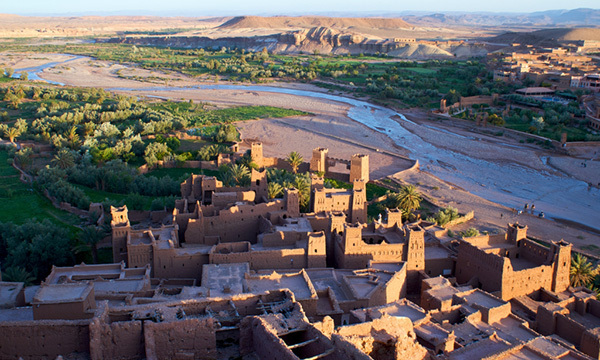 Then we continue on until we reach the Kasbah of Ait Ben Haddou, which is a UNESCO World Heritage Site. 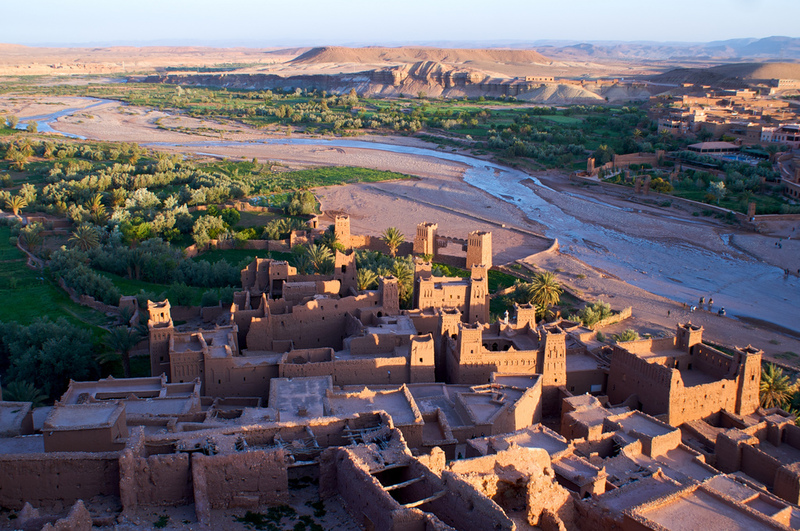 Many films have been shot there including the Mummy, Gladiator, 7 Days in Tibet, Alexander the Great, and Babel… Then continue towards Ouarzazate through the implacable Hamada. 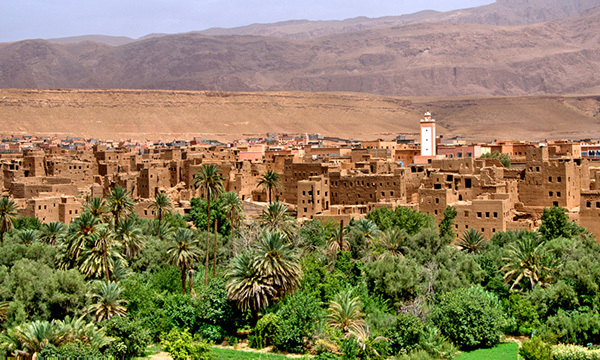 Optional lunch in Ouarzazate followed by a visit to Kasbah of Taourirt and the film studios. The journey then continues along the Road of one thousand Kasbahs to the Dades Valley. Along this road, we will pass through the fascinating town of Skoura as well as Kalaat Magouna, which is known for its roses. After arriving in Boumalne Dades, there will be dinner and an overnight stay. 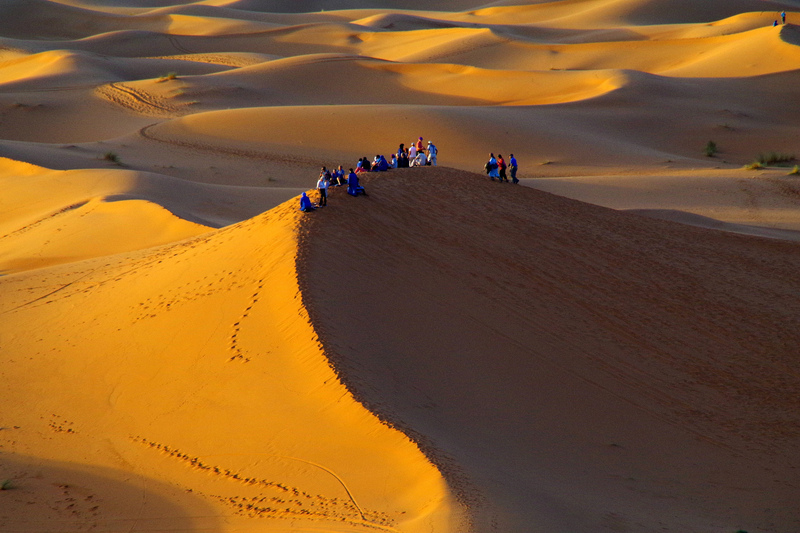 After breakfast, we go from Dades gorges to Erg Chebbi Sahara desert in Merzouga. Berber villages are scattered along the way, we’ll pass through Todra Gorges, Tinghir, Tinjdad, Jorf and Erfoud in which we’ll feel the beginning of the desert oasis of Tafilalet, and then we continue to the Hotel in Merzouga, after relaxing few minutes you will take some of your luggage in small bag (the necessary for the night in desert) and leave the other luggage in the hotel, then we will ride the camels on an adventure crossing the Erg Chebbi sand dunes, this is a great opportunity to take lovely pictures of the sunset and sunrise. 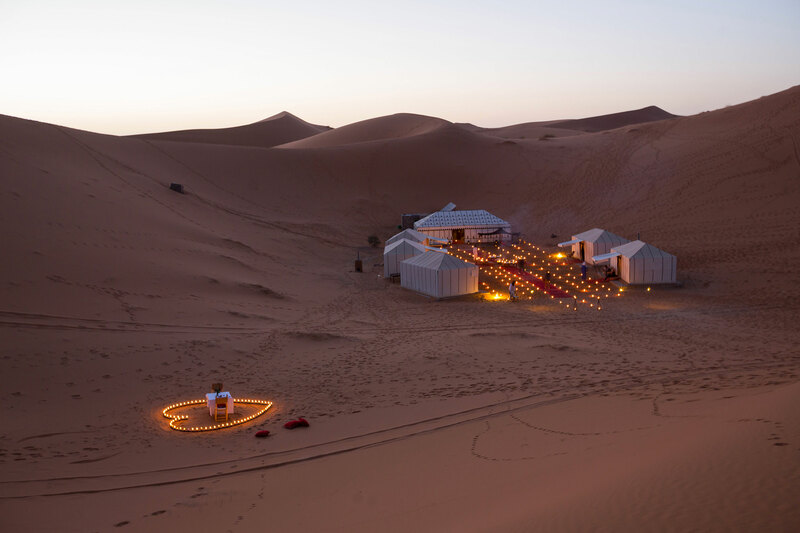 When we reach the camp, we will leave the camels and take a walk to the highest sand dunes to watch the sunset, we will spend the night in a camp (Berber nomad tents) with drums music in the middle of the Sahara. We will wake you up early morning to watch the sunrise in dunes, then we ride the camel back to Merzouga, after the breakfast we take shower in the Hotel, we start our journey back to Marrakech through different areas and different Berber villages ( Alnif , Tazarine , N'kob ) until we reach Ouarzazate where we will use the same road back to Marrakech. By late evening, you will be dropped at the hotel.